how many or how much exercises at the end of the page. When we are asking about the quantity or amount of something we use How many or How much at the beginning of our question. We want to know the amount or quantity. We want to find out the price, quantity or amount of something. dialogue is just the pretext to introduce the topic. just really working on your enunciation and if you feel comfortable or confident. on that’s great and I look forward to seeing you and little later in the recap. I’ll now let you study, bye bye. how much? How many? Revision of countable and uncountable nouns. 1/English Sentence Practice with how many or how much exercises. The food is very good. John asks ” how many more dishes are coming? That’s it. Have we got any toothpicks on the table? No, I will ask the waiter to bring some. The waitress is walking towards the table with some spoons. She does not understand. They say “never mind” and they ask for the bill. How much is it? We will go halves, fifty-fifty. That was good fun and we will do it again sometime. I will ask the waiter to get our things. How are you getting home? I will take a taxi to Victoria Station and I will take the Bus from there. I’m lucky I will take the tube, my flat is just six stops away. I will get home in time to watch the Rugby highlights. Good luck and now that you have my number we can meet up again soon. Peter waves at a taxi. A taxi stops just a few yards in front but a couple jump in before him. That makes him angry. Never mind another one arrives immediately. English Grammar with how many or how much exercises. How many or How much? How much is the jacket? How much are the jackets? How much will this all cost? How much + uncountable noun to know the quantity or amount of something. How much time do we need to get there? How much water do you drink per day? How much money did they spend? How much milk is left in the fridge? Revision of “Many” or “much”? Let’s learn how to identify countable and uncountable nouns! Nouns can be put into different categories such as plural and singular, but also countable and uncountable. They have a singular and a plural form. They only have one form, the singular form. They do not have a plural form so they always use a singular verb. They cannot use the articles “a”, “an” or a number (one, two, three…) before them. Countable nouns are very common (a sister, a classroom, a friend, a teacher…). So how can I recognise uncountable nouns? “language” is a countable noun > I speak lots of languages. I speak a lot of languages. / I don’t speak lots of languages. I don’t speak a lot of languages. “coffee” is an uncountable noun > I drink lots of coffee. I drink a lot of coffee. / I don’t drink lots of coffee. I don’t drink a lot of coffee. “lesson” is a countable noun 1/ I have lots of English lessons. – I don’t have lots of English lessons. 2/ I have a lot of English lessons. – I don’t have a lot of English lessons. 3/ I have many English lessons. – I don’t have many English lessons. “work” is an uncountable noun > I have lots of work. I have a lot of work. > I have much work. / I don’t have lots of work. I don’t have a lot of work. I don’t have much work. subject + will + verb + object. I will leave tomorrow morning. I will learn English this year. a request: Will you help me with this? / Won’t you lend me the car? an offer: I will drive you home. / We will help you with the move. a refusal: I will not let you down. We won’t accept these terms. a conditional: If it snows, I will cancel the trip. I won’t arrive on time if there is traffic. English Speaking Practise with how many or how much exercises. Do the following how many or how much exercises. How much is this jacket? It will cost you £20. How much will the trousers cost? They will cost you 20 pounds as well. How much time do we need to get? We need about 20 minutes. I drink about 2 litres. How much did you spend at the shops? I don’t know how much I spent. Were there many people at the football match? Yes, there were many people at the football match. I don’t know I think about 20,000, but I am not sure. May I pay the bill? No, we will go 50-50. Will you take the tube? No, I will walk, it is not very far. When will another taxi arrive? I think another taxi will arrive immediately. Hi guys! Welcome back! 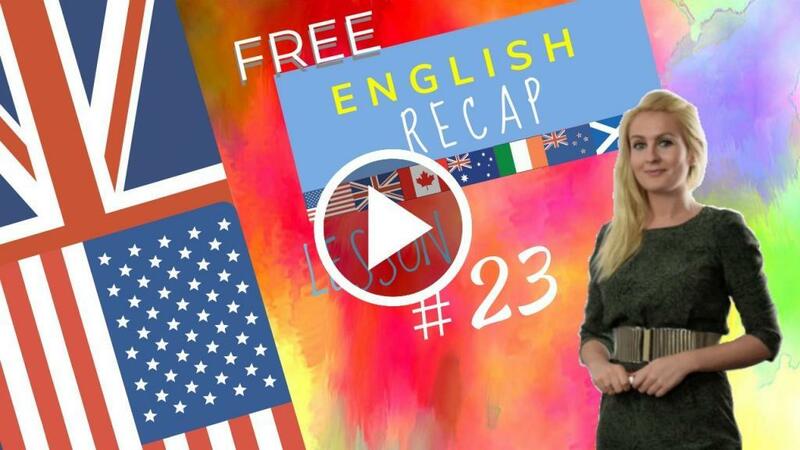 Today we’re going to do the recap of lesson 23 together! We’re going to use this lesson as a pretext to review the pronunciation of the -S endings. We’ve seen this before but we’re going to use examples taken from today’s dialogue and grammar points. We’re going to practice the pronunciation of plurals and the third person singular of present simple. Let’s run through today’s vocabulary! In England we will say: “a flat”. Sometimes people won’t understand you, depending on where you are speaking English So do also learn the word: “apartment” (1″P”). That’s it for today guys! I look forward to seeing you next time! Bye for now!